Next generation gaming and mega movie-based action collide in Street Fighter: The Movie! All-new super attacks and combo finish moves make this the best Street Fighter yet. 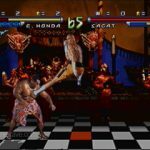 Digitized backgrounds and characters from the hit movie – including Jean-Claude Van Damme! Sometimes hindsight can be an eye opening experience, and not just in that “lesson learned’ kind of way. In this case, an old friend gets a fresh look and it turns out he isn’t so much of an embarrassment as I remember. First, a little bit of history. 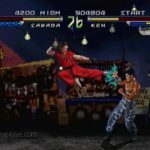 When the live-action movie was coming out, Capcom was at war with Midway with Street Fighter and Mortal Kombat fighting for your every quarter at the arcades (remember those?). 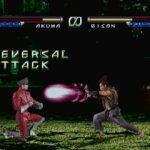 Capcom, feeling threatened by the rival, went to a Chicago-based company called Incredible Technologies to design a game that would tackle Mortal Kombat’s sudden juggernaut. This meant digitized graphics of the actors and locations, a new juggling system, and new move sets. The final product was something of an oddity to an atrocity based on where you stood. 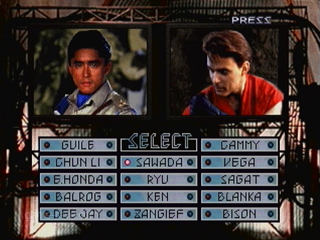 Screen-capping all the actors from the movie, IT went with a seriously darker overtone than your standard SF game, most likely to appease the MK fans. 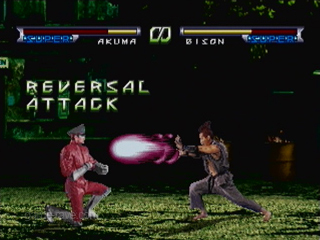 Levels were darker and at nighttime, including a bizarre torture pit with handcuffed characters that resembled Shao Kahn’s stage from MKII, and more. 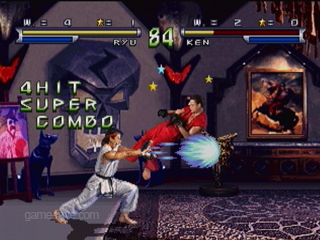 The new combo system was now juggle and chain heavy like MK, but when wrapped around Street Fighter’s move sets, provided some absolutely amazingly looking juggle combos. A Ryu / Ken player could uppercut into a hurricane kick into an uppercut and then catch them with a fireball. 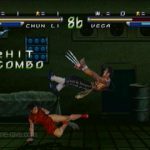 There were also peculiar moves given to characters, like Cammy suddenly having a whip and M. Bison getting an electricity bolt move. Other interesting features included your Health Bar exploding from a Super Attack finish and “Mini-Supers”. While the game had its fan base (myself included), Capcom must have realized that was not the way to go, and when it came time for the home version, went back to what they know best. 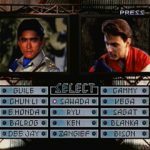 The PlayStation and Sega Saturn version of Street Fighter: The Movie are completely different games from the arcade. Essentially, they are re-skinned copies of Super Street Fighter 2 Turbo with some minor adjustments. While this still pains me for not being the arcade game, after taking a third look, there’s actually some really nice aspects of the home version. First, let’s discuss the over all aesthetic look. The only true kink is in the characters themselves. 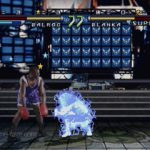 Due to ram limitations, and worse still, the necessary re-editing to get all the Super Turbo moves in, our live-action cast is fairly pixilated and blurry. A little worse then the home Mortal Kombat crew, but not as bad as other projects with the same graphic style. Where it really hurts is that in many fighters you can clearly tell where they had to either splice in animation frames (color palettes shift back and forth) or worse, hand draw the needed frames (easily seen in Ken’s standing, spinning kick). Sometimes they were successful, sometimes not. This is made up for with the backgrounds, though – as they are very well done and better thought out then the arcade’s random ones. Several of them have interesting interactive aspects to them as well. 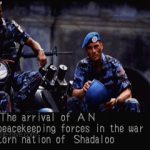 Soldiers will turn their heads and watch the fighters as you move in front of the AN Headquarters, and Blanka’s stage will have him in his human form should he not be one of the active fighters. Unlike the arcade, which had a few backgrounds chosen at random, each character here gets their own stage, and they are much better representations of the movie’s locales. Also of note is that, while needing a bit of stretched imagination, the artists tried to mimic the original Super Turbo backgrounds as best they could in the provided environments. Cammy’s bridge is now a pier, Blanka’s village is now his lab chamber, Vega still gets his caged environment, and so on. They even improved some stages like Bison’s lair and the catwalk above their command center. Arcade voice overs and special move animations were tossed out and the original Super Turbo versions have been re-colored and slightly edited to fit in with the redone looks. Oddly enough, there are some left over voice-overs from the arcade kept in, and they seem like the worst ones. Ken’s “Hi-Yah!” immediately coming to mind, as well of some of Cammy’s. Control is pretty much on the dot, but due to the actors various poses sometimes not quite matching up to the original animation, certain combos will look wrong or need to be re-learned on the timing side. As cool as Wes Studi is, he sadly looks as stiff as a 2×4 when compared to the contortions of his sprite based source material. Of note are the new mini-Supers. Essentially what would become the EX-Moves in other games, you perform a smaller, but still potent version of your special moves. This usually means two fireballs instead of one, extra kicks in said attack, etc. This adds in a whole new dynamic to combos, and creative types will start racking up the count meter. Where the game shines, as in why you would play it, is in the Story Mode and the Trial Mode. In Story Mode, the game loosely follows the plot of the movie, and instead of guiding you on a pre-determined path, allows you to make choices as to where your next fight will be. Sort of like a simple Find-Your-Fate Book, this adds in replay value since you can go back and make the other choices. It also does a decent attempt at thickening up the otherwise 3 sentence plot of the film. 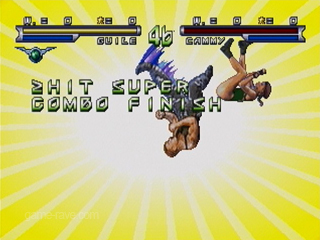 Note that in this mode, you only play as Guile, since he was the main character in the film. If Playing Street Battle, that’s essentially Arcade Mode, with endings for each character. A nice touch here, the writers wrote the endings to work within the context of the film, providing a nice little bit of padding to this particular universe. Finally, Trial Mode is a survival-like bout where you fight a predetermined line-up, and the game will rank you on different aspects of the fight. While it has no real bearing on the other modes, its a fun time waster and can have some interesting results on the characters you don’t normally play with. Finally, in the Versus Mode, you can save your fight numbers (Wins, Loses, Draws) against 3 other opponents by using your initials. Fairly nice little addition, and back in the day would helped spur rivalries with friends…when you could still play 2 players on the same system. 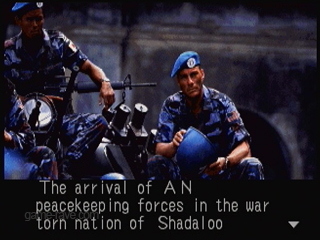 While just a footnote in history now, the arcade version was original for its source material and provided an interesting alternative to the other SF games. The home version, while more patchwork than original, still holds its own as a guilty pleasure and a trip down memory lane. Also, Kylie Minogue in spandex. It’s not the arcade game I wanted, but it’s a game I adore in a wrapper I can appreciate. Not everyone needs Jean-Claude in their lives, but his take on Guile has found a home at Game-Rave. 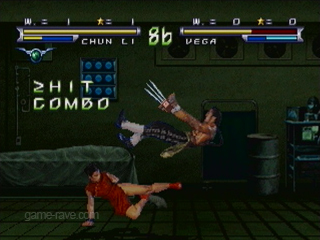 This game was done by Capcom, while the arcade version of the game was done by an American company. Despite the shared name, both are completely different from the other. Among the differences, the major one is the cast of characters. 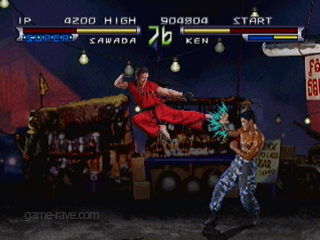 In the arcade, Akuma and a soldier from the movie named “Blade” were playable. 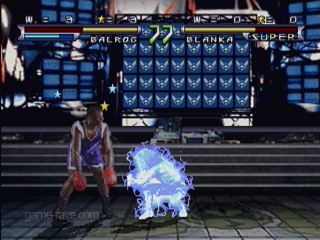 Capcom added in Blanka and DeeJay to their versions. 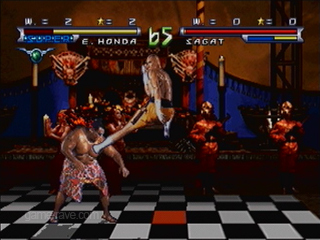 Both were missing Fei Long, who was replaced with the movie created character of Captain Sawada. 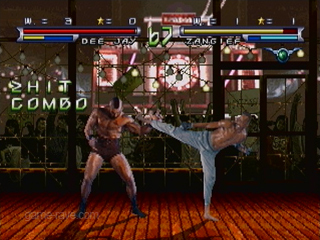 Dhalsim is also missing in action, probably due to having to either a) animate the extended limbs or b) he doesn’t fight in the movie. T.Hawk is also mysteriously absent from both. Raul Julia, battling stomach cancer while acting in the movie, was never available for his motion capture segments. His stunt double, Darko Tuscan, filled in for the game sequences. Raul Julia’s only appearance in either game are in the stills and opening movie clips He passed away before the movie hit theaters. The arcade version was fairly not Street Fighter like. 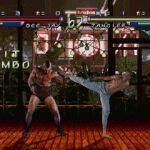 Besides having a somewhat Mortal Kombat inspired combo system, many characters had moves that either made no sense or were not well thought out. 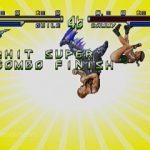 This included Cammy having a whip, Chun-Li throwing a literal bird-like image for her fireball, and more. There is also a stage level that looks like some sort of torture pit not seen in the movie. There’s a nifty little hidden continuity in the game. If in Blanka’s stage, and someone is Blanka, his torture chamber is empty. However, if both players are someone else, you can can see him in his human form writhing in the chamber. All endings of the game are written from the movie’s point of view, which adds a nice little bit of closure. Interesting little tidbit: Ernie Reyes Sr., who did the motion capture for Akuma, is the father of Ernie Reyes Jr. – the pizza boy from TMNT II who also did the stunt work for Donatello in TMNT 1. In the instruction manual, Capcom redrew original sketches from Street Fighter II to have the illustrations more closely resemble the actors in the movie. 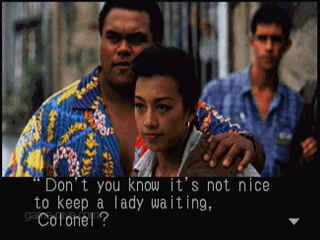 The Japanese name for the game is Street Fighter: Real Battle on Film. 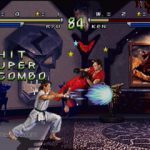 While the Saturn was in full swing, this was the official first fighting game AND first movie-based game for the PlayStation. The movie’s plot has nothing to do with the game. Ken and Ryu are gun runners, Chun-Li is a reporter, E-Honda and Balrog are her crew, and Zangief and DeeJay are part of Bison’s henchman. Still the only game that was based on a movie…that was based on a game. Packaging continues Acclaim’s rule that every sentence must end in an exclamation point. 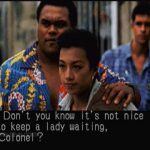 When the (god awful) Legend of Chun-Li film was in the planning stages, Jean-Claude Van Damme was asked to return as Guile in the film, but nothing ever came of it. Akuma is available via a selectable code. Among the random changes and additions, Vega is mysteriously without his mask. 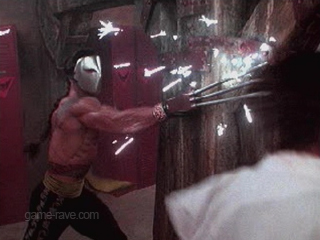 In the arcade version, he wore his mask, and could lose his claw. If you watch the opening video full of movie clips, pay very close attention to the part where Guile leaps from the explosion in the Bison headquarters. The stunt double just barely crosses the dividing line between the pyrotechnics and safe haven when the explosion is set off. In the film, Cammy is in various AN uniforms. Only in the game is she in her ‘proper’ leotard. Guile and Chun-Li are in Championship / Turbo editions of their outfits, and Ken & Ryu are both as close as they could get costume wise. The rest of the crew is pretty well done. What’s interesting is how Sawada’s character replaced Fei Long, yet still essentially retains Fei Long’s outfit style, just in military garb.